When Klinger goes house hunting, he winds up getting trapped by a slick real-estate agent. The Klingers search frantically for a new apartment as Soon-Lee is about to deliver their first child. The first season finale sees the Klingers decide it’s time to find a bigger place to live. Their tiny apartment is filled to the brim with baby things. They go to a real estate agent named Jay Utall for help finding a nice apartment. Instead, he convinces them to buy a house. Unfortunately, the whole thing is a scam. There’s a $2,800 payment due in two years, a payment the Klingers will never be able to afford. But the contract has been signed. 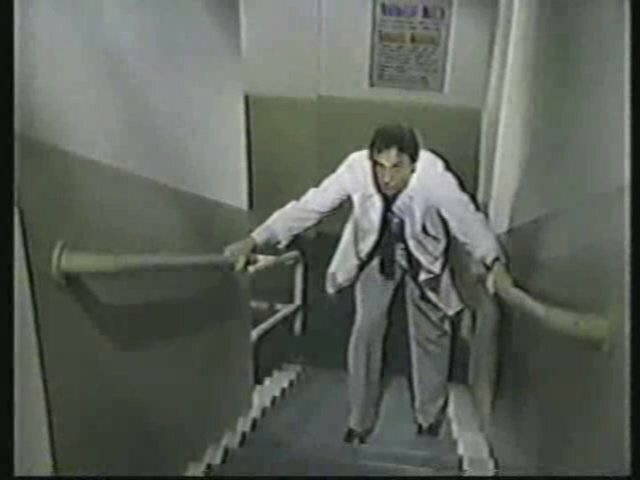 Dr. Boyer has to take the stairs after the elevator goes out. It’s an exercise in frustration and humiliation. The experience reminds him how much he hates his life and he takes it out on his coworkers and patients. Dr. Boyer takes the stairs. Meanwhile, Father Mulcahy gets new glasses. Everyone tells him he looks different but nobody can figure out why. Mike D’Angelo tries to get even with Dr. Boyer, who keeps making fun of his weight, by joking about Boyer’s artificial leg. It backfires. The Potters invite the Klingers, Father Mulcahy, and Dr. Boyer over for dinner. Klinger shows up with a bandaged hand and forehead. He told Soon-Lee he fell down but the truth is he got into a fight with Jay Utall. Two policemen show up to arrest Klinger on charges of assault and battery and haul him off to jail, where Soon-Lee goes into labor. After 22 episodes, what have I learned about AfterMASH? The show isn’t as bad as its reputation suggests. “Up and Down Payments,” like so many other episodes of AfterMASH (and M*A*S*H) suffers from trying to include too many characters. Father Mulcahy’s minor storyline is pointless. Likewise, Mike D’Angelo appears in a handful of scenes but contributes nothing to the episode. Otherwise, the episode is a decent end to an uneven season. Poor Klinger. He’s spent much of the season trying so hard to provide for his wife and future child. Despite his own history of scams and schemes, he let his guard down and allowed himself to be conned by a conman. It’s his own fault for listening to a real estate agent for advice about the G.I. Bill and, more importantly, for not reading the contract before signing it. I’m still not a fan of Dr. Boyer, although at least here we’re given a glimpse of where his anger comes from. Watching him struggle to walk up a few flight of stairs is painful–which is the whole point. It’s too bad it took six episodes to see him as a human being and not just a sack of bitterness and contempt. I don’t know how viewers reacted to the double cliffhanger ending, with Klinger behind bars and Soon-Lee in labor, but after watching it I was very curious to see how the Season 2 premiere unfolds. Alma Cox doesn’t appear in this episode. “Up and Down Payments” marks the final appearance of John Chappell as Mike D’Angelo. It’s also the last episode in which Barbara Townsend plays Mildred Potter. Recurring character Nurse Parker, played by Joan Sweeny, makes her first appearance in this episode. She returns in three episodes during Season 2. While talking about clothing, both Potter and Dr. Boyer refer to their time in Korea. Klinger mentions leaving the service while chatting with the real estate agent. The two bond over being veterans. 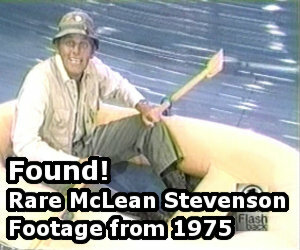 This is the eighth of 13 episodes directed by Burt Metcalfe. This is the eighth of 13 episodes written or co-written by Ken Levine & David Isaacs. Did you mean to add something to the end of this sentence? I’m sure I did but for the life of me I can’t remember what it was. The new show that took over the “AfterMASH”/”M*A*S*H” time slot the following Monday night that March was something called “Kate and Allie” … which would go on for 6 seasons and earn some Emmys along the way. I sooo resented that show for booting out the continuation of “M*A*S*H” that I refused to ever watch that program, and still have never seen it to this day! When this season finale aired — despite the solid ratings — there strangely was a bit of a question mark as to whether “AfterMASH” would get a second season. I had some communication with a staff member from one of the CBS stations informing me that some of the affiliates were disappointed in the program, and TV Guide even ran an article that spring about the then-recently produced “Walter” pilot that said CBS might decide to pass on a 2nd season of “AfterMASH” in favor of committing to the new series involving Gary Burghoff! As uneven as AfterMASH was in the first season, it was still better than much of what was on TV at the time. CBS really screwed the pooch in the second season by putting it up against the A Team and regressing Klinger’s character back to absurdity. The show seemed to lose all momentum with the change in theme. I was glad when they mercifully axed it.